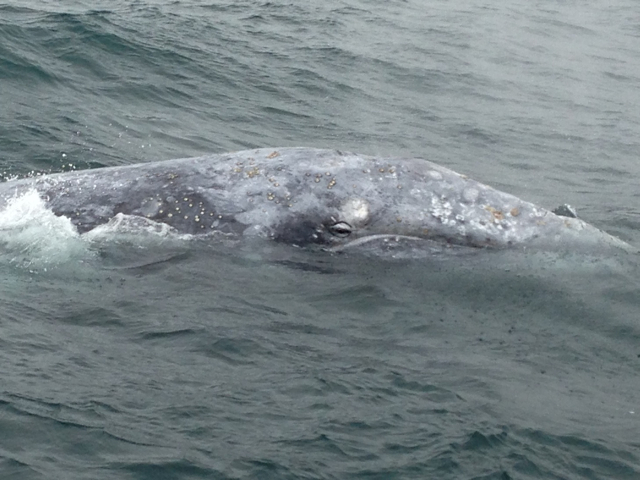 Gray whales are opportunistic feeders, which mean they will eat food from a wide range of sources. Along the coast of Depoe Bay, Oregon they mostly feed on mysid shrimp found at the edge of kelp beds. There are billions mysids are found in the waters off Depoe Bay. Gray whales are like cattle on an open range, they will eat one area down and then move on to find more food. How They Eat: Gray whales are baleen whales and they are in the Mysticeti category which means moustache whale. In place of teeth on the upper jaw, the Mysticetes have a series of overlapping plates made of keratin it’s the same substance as your fingernails. The inner margin of each plate, next to the tongue, is fringed with bristles that trap organisms but still allows water to pass through. Hanging from the top jaw of a gray whale are blonde colored baleen plates about one foot long. The inside edges of these plates have bristles which trap food organisms like mysid shrimp or crab larvae. Like all baleen whales, gray whales draw in food-laden sea water and push it through the baleen plates, filtering out food with the bristles. How it works: When the gray whale depresses its 2,000 pound tongue, this forms suction that brings in water and small food items. Once the food is inside the mouth, the tongue is lifted up and the mysids become trapped on the inside of the baleen. The water then leaves through the openings of the baleen. The tongue licks these bristles clean and then the prey move through the grapefruit sized throat. Two to five throat grooves also expand when the whales feed to increase the surface area. Baleen plates hang from the roof of the mouth and these one foot long baleen plates filter food like mysids from the water. Where They Eat: Depoe Bay’s resident gray whales are commonly seen feeding in and around kelp beds in water depths of 10 to 60 feet. Huge swarms of mysids live in these kelp beds during spring, summer and early fall. These huge swarms range from 3 to 20 feet thick and have billions of mysids. One gray whale is estimated to eat a ton of these mysids per day. One sign of grays feeding on these mysids is when a partial fluke is exposed at the surface.